Submit your earnest money deposit online. By clicking this button, you are transferring to another website. We know how hectic your life can be. That’s why Continental Title Company continues to strive to be an innovator in the title industry. We would like to introduce you to Online Earnest Money Deposits! 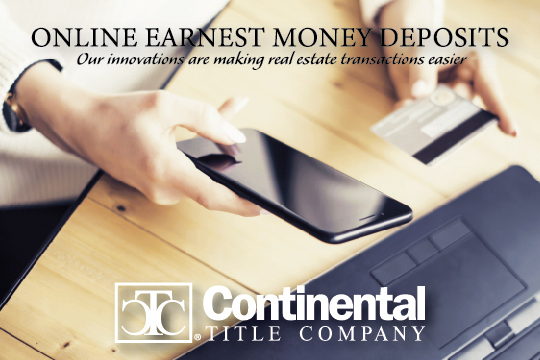 Buyers can now submit their Earnest Money Deposits from their computer or mobile device instead of digging out the old checkbook and driving to one of our multiple locations!